If you are looking for adventure in the Riviera Maya, spend a day at Xplor, an adventure park located just south of Playa del Carmen. 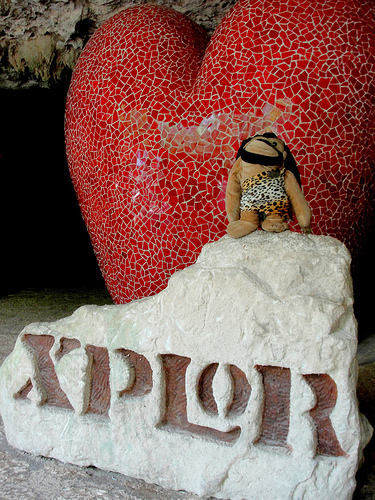 Recently, Hacienda Tres Rios, along with other bloggers and Tweeps from the area, was invited to get to know Xplor and help promote the contest they are holding in Mexico to name the caveman stuffed animal that appears in the photo above. Xplor makes the most of the tropical jungle and underground caves and rivers that the Yucatan Peninsula is known for. Much of the park is underground. That being said, you will spend part of your day on solid ground as well, exploring the jungle in Amphibious vehicles, and WAY above ground as well, on thrilling, but very safe zip line circuits. It’s probably best to start your day off zip lining, because you will need a lot of energy to climb all of the towers. Have a big healthy breakfast. There are a total of 13 zip lines in the 2 circuits. There is also a waterslide and a few water landings, which feel great on a steamy day. Then, after all that climbing and flying, which takes a couple of hours, you are definitely going to need a snack. Stop by one of the snack areas for delicious and nutritious smoothies, juices and cookies. Now you might want to head for the underground river rafts. You can choose a one or two person raft, which you will navigate with two small paddles on your hands! The stalactites and stalagmites are beautiful to look at (No touching allowed!) and remind us that our Earth is something we should cherish and protect. Since you are already wet, why not head for another underground river? This time you will be swimming. It’s over 400 yards long, but don’t worry, they will provide you with a life vest. The “Heart of Xplor” (see first photo) would be a great place to meet up with your companions before you head to the buffet restaurant for lunch. The buffet is very large and there are plenty of choices. However, don’t overeat, because now it’s time to drive your Amphibious vehicle through the jungle, underground caves and even a waterfall! Before you head back to your resort, stop by the Xplor gift shop, which carries a large variety of merchandise, and it’s underground! Don’t miss this adventurous yet safe ecopark. A day at Xplor will add a memorable twist to your vacation in Cancun, Playa del Carmen or the Riviera Maya. Tip: Wear water shoes and surfing-type clothes, you are going to get wet! Have you been to Xplor? What is your favorite part?